Travel to Thingvellir National Park, a unique geological site where two tectonic plates meet – and the only place where you can see the Mid-Atlantic Rift above sea level. As you descend into the valley, the steep cliffs that you’ll see are quite literally the edge North America; as you continue to the other side of the Park, you’ll be ascending onto the Eurasian Continent! Reaching the tranquil shores of Lake Thingvallavatn, you’ll see the world’s oldest democratic Parliament, founded more than 1,000 years ago! Then thrill to one of Iceland’s most famous geological wonders – the Strokkur Geyser that regularly erupts 100 feet into the air. At the Golden Waterfall, you’ll behold a thunderous cascade of icy water that plunges into a deep gorge. Depart the capital after breakfast and travel northward through the countryside. In Borgarnes, you’ll visit the Settlement Center where fascinating exhibits reveal the stories and history of the intrepid Vikings who conquered the open seas to settle Iceland long ago. Then sit down to lunch in the pleasant coastal village of Hvammstangi. Continue your journey to Glaumbaer Farm to see the 19th-century turf farmhouses that were typical in rural areas of the island until the early 1900’s. With few large tracts of forest for construction, the stone-and-turf design of these buildings required relatively little lumber. Nearby, the century-old Vidimyri Church is considered one of Iceland’s most important architectural landmarks. Built of driftwood and turf, its altarpiece was brought from Denmark and dates to the early 17th century! 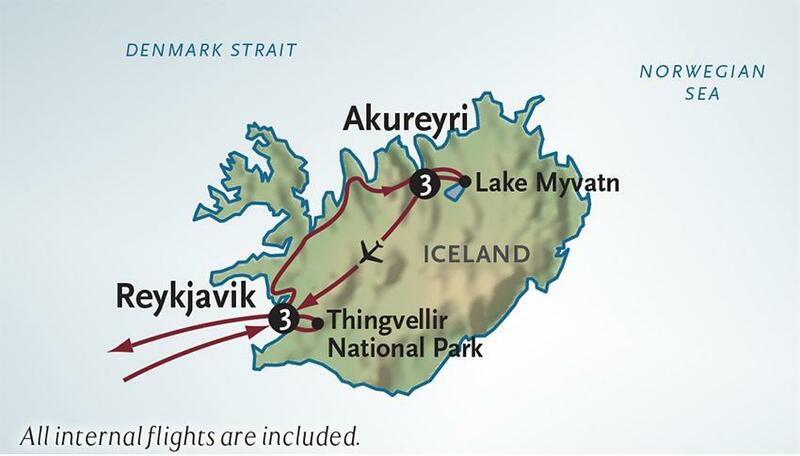 After breakfast, you’ll embark on a whale watching expedition into the northern fjords. With experienced naturalists and General Tours vessel’s unique viewing platforms, this adventure offers a chance to see humpback and Minke whales along with dolphins, porpoises and a variety of sea birds. Blue, fin and orca whales are sometimes spotted as well. After breakfast, you’ll join General Tours guide to travel along the beautiful Eyjafjordur coastline, with its stunning views of mountains and sea. At the spectacular Godafoss Waterfall, you’ll behold a thundering cascade that plunges 40 feet across a chasm that stretches nearly 100 feet across. In the year 1000 after Christianity was declared the official religion of Iceland, statues of Norse Gods were hurled into the Falls – earning these cascades its name as the “Waterfall of the Gods.” Next you’ll discover the unusual lava pillars and other bizarre formations of the aptly named “Dark Castles.” Then see the steaming fumaroles of Hverir and a warm, startlingly clear underground river at the Grjotagja Rift.